Opal will be rolled out onto buses starting on Monday, 3 months ahead of the initial “end of 2013” deadline set by the government. This follows the ferry roll-out which was recently completed 4 months ahead of schedule. The first bus route to use Opal will be the 594/594H from Hornsby to the CBD. The Herald reports that the next bus route is likely to be “an inner-city service run by the government-owned State Transit”. Fares for buses will follow the current 3 band structure, but be calculated on a straight line point to point basis, rather than the actual distance traveled by the bus. Importantly, for the first time the fare penalty for transferring from one bus to another will be removed, with passengers paying a fare as though they had caught a single bus for the entire journey regardless of how many individual bus trips they used to reach their final destination. A source within Transport for NSW has informed Transport Sydney that light rail will be brought in under the bus network for fare calculation purposes. This will mean that passengers who currently take a bus into the CBD from South East Sydney will not pay any extra for transferring from a tram to a bus (or vice versa) once the CBD and South East Light Rail begins operating in 2020. However, it remains uncertain whether this will extend to M2 buses that are converted into feeder buses for the North West Rail Link when it opens in 2019. There are three main changes to the existing fare structure with Opal: single mode integration, a fare cap, and simplification. Currently (unless using a myMulti ticket), passengers pay a different fare in going from A to B depending on which mode of transport and how many vehicles they use. If they use a single mode of transport, such as buses, then this penalty will be removed. This represents integrated fares, but only for a single mode of transport. The main impact will be seen on buses, where taking 2 buses to get from A to B is more expensive than taking just one, even when it is both faster for the passenger and cheaper for the government from a cost perspective to do so. Trains effectively already have single mode fare integration as passengers can change trains without leaving the gated area of the station, while ferries and trams make up only a small fraction of public transport trips in Sydney. Fare penalties will remain for multi modal journeys, such as one involving both train and bus. The fare cap is designed to replace discounts currently received for weekly and travel ten tickets. Instead of receiving these discounts directly, passengers will only be required to pay for their first 8 journeys each week, with all subsequent journeys being free. There is also a daily cap of $15 per day, or $2.50 on Sundays. This will have a similar effect to the current discounts, though not for occasional users or passengers with periodical tickets (monthly, quarterly, or yearly tickets). That these changes disadvantage some users is because it also brings in simplification of fares. This was something that the head of ticketing in London, whose Oyster Card operates on the same system as Opal, recommended back in 2011. This decision to leave some users worse off is a tough but ultimately necessary one that needed to be made in order to simplify the dogs breakfast that Sydney’s fare structure has turned into. Instead, Opal cards have value stored on the actual card itself. This allows the tapping on and off process to proceed quite quickly. The information on the card reader is then downloaded to the central server to provide the user’s online account with all of their travel information, including the fare for each journey. This information is downloaded quite quickly for fixed card readers (i.e. train stations and ferry stops) and less frequently for mobile card readers (i.e. buses and trams), probably once a day once the vehicle returns to the depot. This also means that any value added to an Opal card has to also make its way onto the card itself. If topping up credit at a train station, for example, the card can be scanned right there and the value loaded up instantly. If, on the other hand, value is added remotely via the internet then this information needs to be pushed down to Opal readers across the network, from where the value is added to the card next time the passenger taps on or off. As with before, the fixed readers should receive this information almost instantly, while for mobile readers it might take up to 24 hours. UPDATE (2 October 2013): @TheOpalUser has discovered that Opal card balances are updated about 20 minutes after tapping on the card reader on the bus. This suggests that the card readers are connected constantly and thus it shouldn’t take 24 hours unless the mobile network is not working. 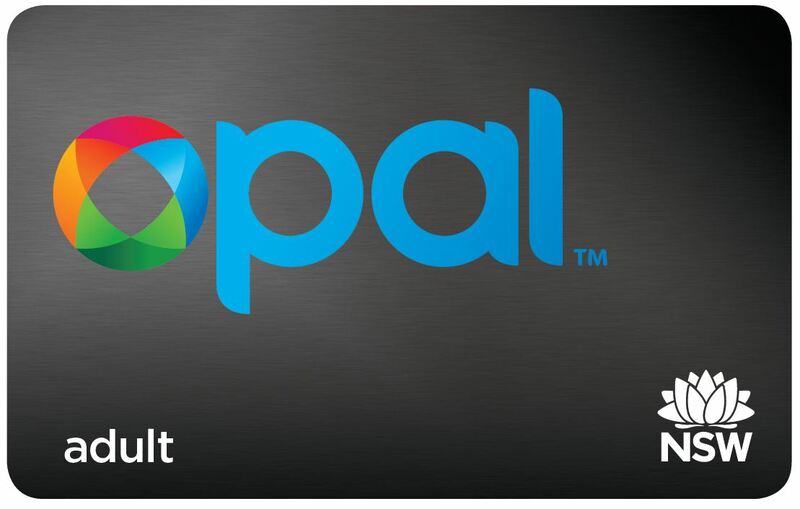 All of this also means that if an Opal card is lost or stolen, the owner can cancel it and still retain their balance on the card as the system would have a record of the balance as of the last time the card was tapped on or off. CORRECTION: In the post Transport Master Plan (part 2): What’s missing? published on Friday 7 September, it was claimed that planning for reservations for future transport projects in the Transport Master Plan had only been done for road projects, and not for public transport projects. This was incorrect, and information on public transport corridor reservations was included further into the report. The error was due to the large size of the report (370 pages) and limited time available to read through it in detail and has now been corrected. Before looking into what the Transport Master Plan has to say on roads, it’s worth giving some perspective on private cars vs public transport. Roads, and the private motor vehicles that run on them, provide two major benefits over public transport. First, they are significantly more flexible in terms of timing and journey start and end points. Second, the majority of the cost is borne by the user (some costs, such as noise and air pollution, or the free use of roads, are communal costs, but these are actually quite small), whereas public transport is heavily subsidised (in Sydney the user pays 20% to 50% of the total operational costs, and none of the capital costs, of public transport). The biggest benefit of public transport over private road transport is in capacity. Assuming cars travel spaced 2 seconds apart, you can fit 1,800 vehicles per hour per lane. Ignoring effects of delays from red lights and cars with multiple passengers, that’s 1,800 passengers per hour. A Waratah train has a seated capacity of 896 passengers, and the current maximum capacity on the Cityrail network is 20 trains per hour (which the Harbour Bridge and Eastern Suburbs Lines both get very close to during peak hour), giving you just under 18,000 passengers per hour. In other words, rail has a capacity 10 times the size of cars. To put this into context, the Sydney Harbour Bridge has 10 lanes: 2 for rail, 7 for cars and one bus lane. If you were to convert all of these 10 lanes to private vehicle traffic, then it would have the same capacity as a single track for rail. This is not to say that there is no place for new roads in Sydney, in fact when a new road is financed and built privately, then funded via tolls in a user pays manner over an agreed period of years then the government should be building as many new roads as it can. 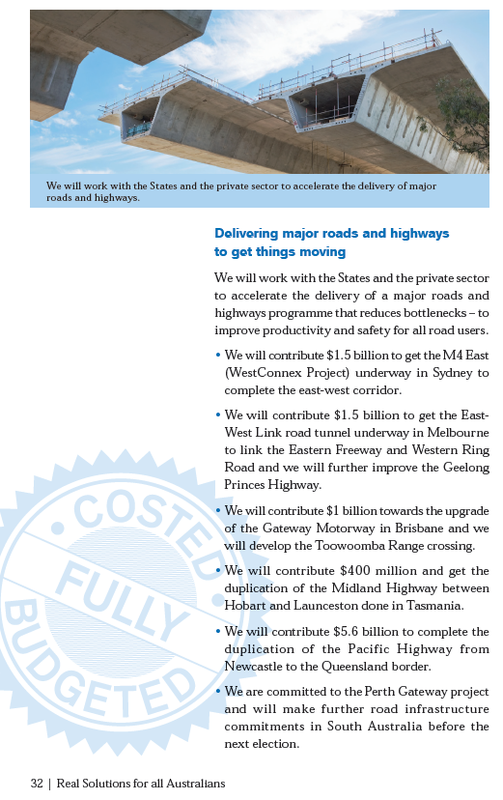 But if the government has to fund the new road, then the question needs to be asked “will this cost one tenth of the cost of a rail line”? There was a great post about this at A State Of Mind, which talks more about this sort of concept. 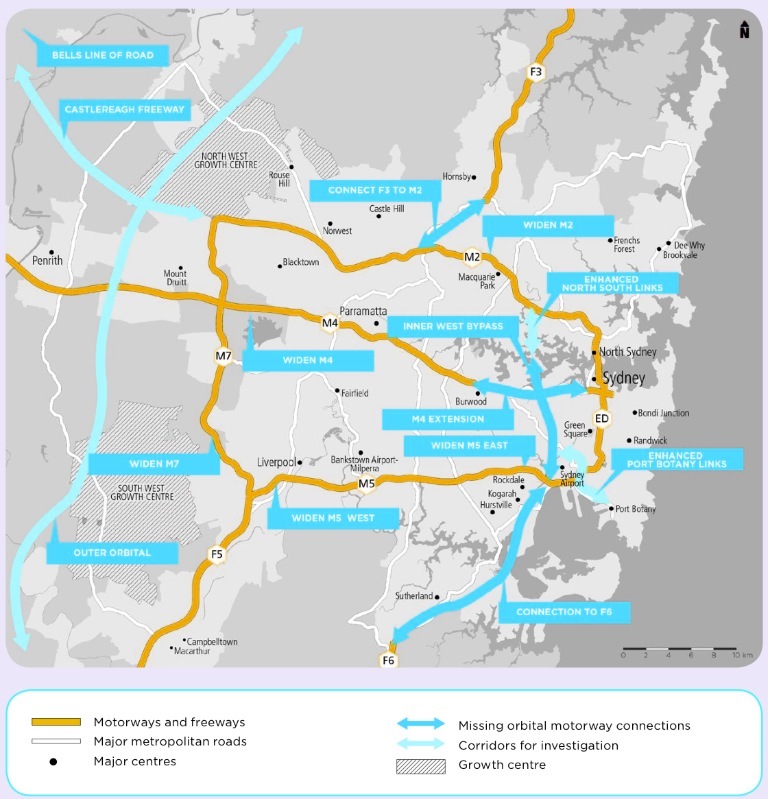 Road projects announced in the Master Plan include the current M2 and M5 widenings, an M4 East, an M5 East duplication, an Inner West Bypass (linking the M4 East with the M5 East), an F3-M2 link, an extension of the F6 through to the CBD, a link between Port Botany and the Airport, widening of the M7 North of the M4, widening of the M4 East of Parramatta, the Castlereagh Freeway (between the M7 and Richmond) and an outer orbital going North-South along outer Western Sydney. By anyone’s reckoning, that is a big wishlist! What we don’t know yet is the priority and the specific order in which they will be built. The M2 and M5 widenings, currently being finished up or having just started, are obviously the first cabs off the rank. And based on the 6 corridors which are expected to face the most congestion, the other projects with high priority appear to be the M4 East, the M5 East duplication, the Inner West Bypass, and the M4 widening. This should all be clarified by Infrastructure NSW when their 20 year report is released to the public next month. However, merely building more roads is not the solution. New roads cause induced demand – more people get into their cars until eventually roads are saturated and congestion returns. Doing this will not eliminate congestion, it will only move the congestion closer to the ultimate destination (i.e. the Sydney CBD), and cost tens of billions of dollars in the process. To quote the Herald, “$10 billion is an awful lot to pay for a bigger traffic jam”. Distance based tolling – This is currently in place on the M7, where you pay based on the distance travelled, and is capped at $7 per trip. Time based tolling – This is currently in place on the Harbour Bridge/Tunnel, where you pay a lower toll during off peak hours in order to encourage a more even spread of car travel throughout the day. An increased parking levy – This is an existing charge on each parking space in the CBD, charged to the owner of the property that owns the space, and may be increased. In all three cases, commuters would be discouraged from driving into and parking in the CBD during peak hour. Those who do would pay extra but receive a better travel experience with less traffic and more abundant parking, while the funds raised would go towards funding transport infrastructure. The report recommends using tolls to both fund new infrastructure and manage congestion, while reforming the tolling system to give Sydney a city-wide consistency (page 329). If the government actually does implement these policies in order to fund the new roads that are financed, built and operated by the private sector, then they might actually achieve the goal of alleviating congestion without significant cost to the taxpayer. And if that is the case, then these are definitely roads that the state should build.